A Leyland Atlantean PDR1/1 with Weymann L73F body, joining the fleet of Silver Star, Porton Down near Salisbury, in 1962. This first view shows her on duty in Winchester, during the King Alfred running day on 1 January 2010. I couldn’t resist this second view, as it’s the only time I have seen her addressed to her home. This second view was taken during the rally at Stokes Bay, Gosport, on 3 August 2014. A very interesting company who very much traded on transporting National Servicemen around at weekends. Great livery and distinctive ‘roofbox’! The nearside windscreen ventilator is an unusual feature. I remember three of these (there were four altogether) in Bristol Omnibus service in 1963/4, the others being TMW 853 and VAM 944. I assume Bristol removed the Silver Star fleetname from the dome before repainting. They seemed like a startling innovation among all the FLFs! The fourth one, XMW 706, had coach seats. The PSV Circle fleet history states that TMW 853 went to the USA. That’s the first mention I’ve seen of TMW 853 since c.1970. Along with the others it went to Super of Upminster in the late 1960s but quickly passed to Midas Motor Services of Brentwood. Midas ceased to trade not long after that and TMW seemed to fall off the face of the earth. The other three ex-Silver Star Atlanteans passed from Super to Berresfords in 1967. VAM 944 went to Hale Trent Cakes of Clevedon for staff transport in 2/69 – can anyone confirm that it was subsequently scrapped? I don’t think Hale Trent used it for all that long. XMW 706 was damaged beyond repair in a fire at the Berresfords garage in 9/70, although it apparently hadn’t been used since 8/68. TMW 853 was indeed owned by Midas Motor Service who bought it from Super of Upminster in 1966. 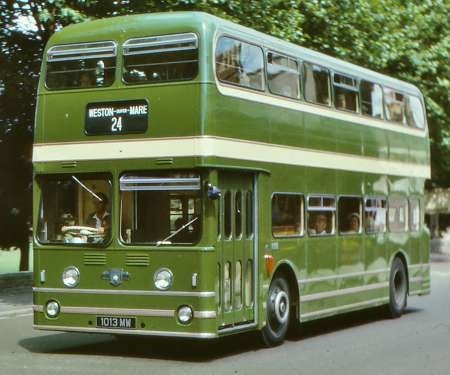 It was still in the red livery of Bristol Omnibus and the roof dome had been removed. Midas put a new gearbox in it and painted it silver blue and black in 1969 and ceased trading in the early 70s when it did indeed vanish of the face of the earth. I remember the excitement of the Atlantean being used to ferry pupils daily from St Helen’s Primary School in Brentwood to the Hutton Poplars children’s home in Hutton. I do not remember it being red though: I remember it as silver-coloured. And was the Bristol livery not green? Further to my own post of 14/2/16, VAM 944 was, according to ‘Looking Back at Independent Double-Deckers’ (by Andrew Wiltshire), operated by Deeble of Upton Cross, Cornwall, from 1975 to 1978. It’s actually illustrated, in service with Deeble, on the front cover of the said publication. No mention of any further ownership, but eighteen years would have been a reasonable life, I suppose. Seeing this startling full frontal of 1013 MW, reminded me that I had a photo somewhere of it. I attach the photo of it in Bristol Omnibus Tilling green (BOC 7999), sans Silver Star top box, in July 1963 in Ashton Park on its way to Weston super Mare. Mr Anon mentions Bristol red livery – really? Probably on the same day, I snapped its mate TMW 853 (BOC 7997) in Lawrence Hill. As the three Atlanteans and service 24 operated out of Marlborough Street I’m not sure why it was at the Works. Either before or after this date the three were operating on the Portishead service, then 85, but it is alleged the local youth took to pressing their external engine emergency stop buttons as they climbed some of the severe hills on the route. 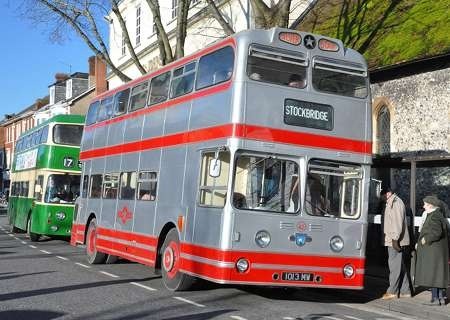 I have just noticed that Bristol went to the trouble of changing the steering wheel to white to comply with their practice of using this to indicate that the bus was wider than 7ft 6in wide! Here is a view of MMR552 and 553 fleet numbers 10 and 26, Tiger Cubs with Harrington coach bodies from the dear departed fleet of Silver Star, Porton, near Salisbury. I have seen and photographed both of them on a number of occasions, but this sighting at the "Harrington Gathering" at Amberley on 3rd June was my first of them together. They may be twins, but they are most certainly not identical twins. My late friend Walter Martin bought two identical Bedford YRQ/Plaxton Panorama Elite III in 1972/3 which were instantly identifiable by several small differences in livery and application – just like these two splendid vehicles. This picture has made my day! From the age of 9 I grew up in Sale in Cheshire and the Silver Star vehicle(s) doing the forces leave service to Manchester spent their lay-over at the premises of Pride of Sale, often venturing out "on hire" on local excursions. They also sometimes appeared "doubly on hire" to North Western for use on the North Wales and Yorkshire Coast services. Sadly my personal experience of their fine fleet was short-lived as they sold out to W&D less than a year after I moved to Sale. A brief pleasure, but still vivid in my memory. It’s good to see the pair together again in a recent shot. I’m glad you found the view interesting, Neville. One of the Atlanteans, 1013MW, survives as well, but I don’t know of any of the other vehicles from the fleet. The idea of reaching destination and then running ‘on hire’ to the local operator caught me out on several occasions. The one which sticks out most clearly is a Red & White MW coach which had arrived in Morecambe on a tour and was acting as a PD3 on the L6 Heysham to Lancaster service, on hire to Ribble. Must have been a surprise for the crew to draw that! I know the feeling Pete – Ribble would seize anything on a busy day. I was always amazed by some of the oddities that would turn up at Lower Mosley Street on X60 duplicates. As I mentioned in my article (on this site) about LMS these included vehicles from East Kent and East Yorkshire which had been commandeered by Ribble staff at the Blackpool end. I also witnessed the arrival of a 36ft Yelloway Reliance/Cavalier on an X60 extra in the summer of 1966 – presumably it had operated a duplicate on their own Blackpool services and then been free for the day for other remunerative work. It also, of course, had the advantage of being able to show both Manchester and Blackpool on its destination blind, but I bet that the Allen family made them pay the top rate for the hire! I well remember during busy summer periods working for Southdown at Eastbourne in the 1970’s and 80’s it was a case of anything goes especially with coaches that were staying on a weeks tour on days when they were not out or coaches that were on day trips, on entering the garage the drivers were asked " what time are you leaving" if it was late enough for the coach to be used that afternoon he was asked to please see nothing was left on the luggage racks as the coach would be used, this of course was in NBC days. The favourite tour coaches used belonged to Eastern Scottish which were at different times Bristol LH’s Leyland Leopards and on one occasion a Seddon Pennine VII. another favourite was Western Welsh nearly always a Leopard but among other companies featured was a Crosville Bedford VAM. 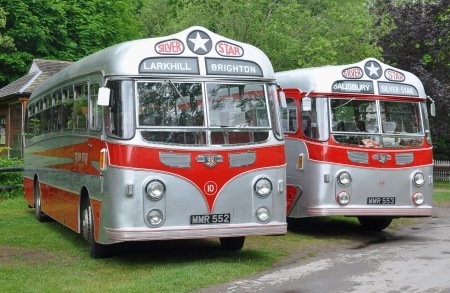 My fondest memory of these is of taking a school party from Eastbourne to Lewes on one of M&D’s superb AEC Reliance/Harrington Grenadiers a totally blissful afternoon, the different companies vehicles driven when on express services however is a story on it,s own. An interesting posting, and I was most amused to read the appreciative comments of some correspondents about these vehicles. I agree with them. Apart from the Leyland chassis and the different treatment around the destination indicators, however, these coaches are pretty well the same design as my recent M&D AEC posting that received rather less fulsome responses. Maybe I’m thick, but I just don’t understand that. I also agree with Diesel Dave about the M&D Grenadiers; superb describes them absolutely. No, Roy, you’re not thick! It’s taken me a while to work it out, but I think the reason for the difference of opinion about the appearance of the Maidstone vehicle versus this pair is the indicator display. These two have a modified version of what many regard as the typical Harrington front dome of the period, with two wide indicator displays. That on the Maidstone looks to be much more of a bus indicator, far more concentrated in the middle of the dome, and I’m sure the more usual style would have made it more attractive to many of our readers. A different way of applying the livery, with a lighter top, might have helped, too. I don’t suppose Southdown would have objected if their neighbour (and associate BET company) had used the Southdown style. Off subject, Neville, but I lived in Ashton-on-Mersey in the late ’70s. We missed each other by a few years, David. I moved to Nottingham when I was 19 (mid-1972) and from there to the USA for a six year spell from 1974. I blame the introduction of the NBC corporate liveries. Emigration became the only sensible option! I can understand that, Neville. Glad you came back, though. I’m with Pete here: I’m still not a big fan of the design, but the overall styling/livery/destination display works much better (and its "polished-up", which might help!). For me the significant differences are: the fog/spot lights and associated moulding, which when combined with the "pointy" dome tend to accentuate the vertical aspect and narrow the front; and the absence of the above-windows moulding present on the M&D vehicle (which seems to be a throw-back to the 1930’s). I stand by my comments on the M&D Reliance, but as I’ve said before, in the right livery an Orion can look good. This just emphasises how important livery and its application is and reinforces all the comments on this forum about kids in paintbox liveries that we suffer today with current operators. Two identical vehicles can look SO different in different colours. I agree David – but I think the converse is true as well. Many colour schemes look well on some vehicle designs but not on others. A good livery is one that is sufficiently robust (and perhaps adaptable) to be applied to different types. Even some of the big groups seem to be recognising this. For example, I dreaded the appearance of "splash it all over" washed out green when Arriva took over Cross Country Trains – but they didn’t, thank goodness! Well, David, we could have a long discussion about the effect of livery and detailed design differences on a vehicle’s ultimate attractiveness. However – maybe I don’t possess a ‘true’ enthusiast’s appreciation of these things – but to me a basically sound and well-balanced design is not somehow transformed, Jekyll and Hyde-like, into hideous ugliness because of such elements. I can understand how one treatment might appeal more than another, but the underlying balance and elegance of Harringtons’ design on these Silver Star coaches, (‘splendid’ was your own adjective), remains apparent in the M&D vehicles, dated destination indicator screens notwithstanding. I returned to the link showing one in Hebble livery, but that exercise has served only to reinforce my view. We can only agree, perhaps, to differ – and Philip, I guess, would be with you rather than me – on this. ‘Two other points in my final comment on this issue. First, Peter’s observations. I agree that M&D’s destination screen treatment is rather ‘bus’ like. Most of their express services were short distance, on which many passengers would buy their tickets from local agents just before travel. A large, instantly readable destination screen thus made operational sense. I’m not sure I follow his point about Southdown livery, however; after more than a year with that company, I never quite understood what their express livery was, and judging by the inconsistency with which it, (and even whether a vehicle should display a scripted or capital lettered name), was applied, I’m not entirely sure that they did either. There you go, Roy. I agree with you on your latter points. Mention of the Bellhouse and Hartwell coaches reminded me of a comment my friend the late Donald Ingham who had been a driver of these beasts told me. The drivers referred to them as Brabs this being a reference to the giant seaplane the Brabazan that flew in the 1950s. One of these coaches was sold to a old persons home in Derbyshire and had its rear end modified to take wheel chairs and eventually was sold for preservation to a group of drivers at YWD Frost Hill depot. Alas this was an abortive venture and I recently heard that it had passed to Ensign for their heritage fleet but it would appear to be too far gone. .
Wow, Chris, what a beauty! (Pardon the irony). What is it? There’s some script below the radiator grille, but I can’t make out what it says. (not ‘Bristol’, surely?). Could it be the builder’s name – I’d have wanted to remain anonymous if I’d had anything to do with it. More details from someone, please. I’m intrigued. Philip’s remark about the Bellhouse Hartwell coaches’ nickname was amusing, too. Very appropriate. I read elsewhere that they were also nicknamed ‘Sabrinas’, for fairly obvious reasons. Reference to Chris H’s link, Barton’s 657 was certainly no oil-painting, and the normally attractive livery was applied in a rather fussy way. I remember it as one of those quirky members of the Barton fleet – an in-house rebody of, if I remember its sound correctly, a half-cab Leyland TS? 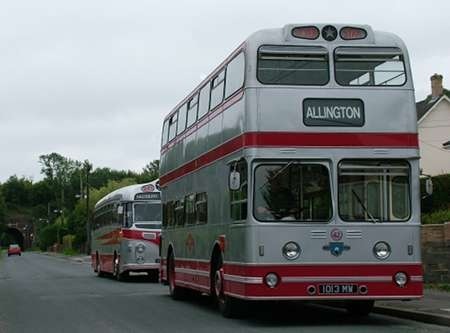 In the early/mid 50s it often worked on the route 10, Nottingham – Long Eaton – Kegworth – Loughborough. There were a few similar rebodies, plus the much more attractive style just visible behind, but I think there were only one or two of this particular design. Small point, Philip, but if I don’t mention it someone else surely will. The Bristol Brabazon was a large landplane, powered by eight Bristol Centaurus piston engines mounted in pairs driving contra rotating airscrews. The huge contemporary flying boat was the Saunders Roe Princess which had ten Bristol Proteus turbo props. Both were misconceived for the post war air transport scene. As originally built, MMR 553 also featured the "V" shape front trim but fairly early on presumably had a bit of an accident and for most of the time with Silver Star appeared as we see it today. You see the safe path I tread to avoid controversy with body designs! I thought, Roy, that the writing said ‘Daimler’, but could be mistaken. And thanks, Stephen, for your thoughts on the body’s origin. I believe the Sabrinas were SUT. 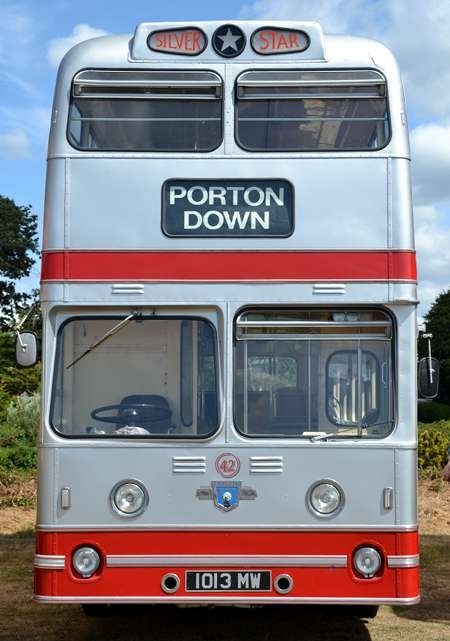 I realise that we have taken something of a diversion but the excellent picture of the Barton BTS1 made me wonder, whilst the body was built in Barton’s own workshops and rightly ascribed to them, I wonder how many components were bought in, such as front wings, front dome and windscreen frames etc. I may be wrong but I can’t imagine all of these being produced by Barton, or any other operators who built their own bodywork. One thing is certain though, these were sound vehicles which gave Bartons good service. They must have been considerably better than some of the offerings from the myriad of post war British coachbuilders. Discussion on styling should also take into account changing fashion- less so with buses than coaches- as well as functionality. I think the Bridgemaster/Renown expressed a fashion for the square rather than curves, seen in buildings of that era. Liveries/trim were lightened and simplified in the 60’s. Curves were very thirties/forties and in the case of Barton, the "diner" look became a caricature. Then there is the "classic" look like the Leyland/Leyland PD2, and most ECW output, which could seem boring- but the style had to last 10/20 years. Now today… the Optare Spectra already looks dated and those areas of purposeless blind glazing in other, later designs… why? Just come across the site and was taken aback to see the Silver Star Leylands. I was stationed in Tidworth 61-62 and used to travel up most weekends to Manchester using Silver Star. The drivers name was Vic I believe. Glad about your surprise delight, Richard! Companies like Silver Star must have started to feel the pinch once the last National Servicemen finished their service in 1962 and their places were taken by civilians, who mainly lived locally. Strangely enough, I always found it better to go home by train, with reasonably-priced Forces Return tickets. We still had an extensive rail network then, too! I have some very happy memories indeed of outstanding small operators that I encountered and used during National Service 1954/5/6. 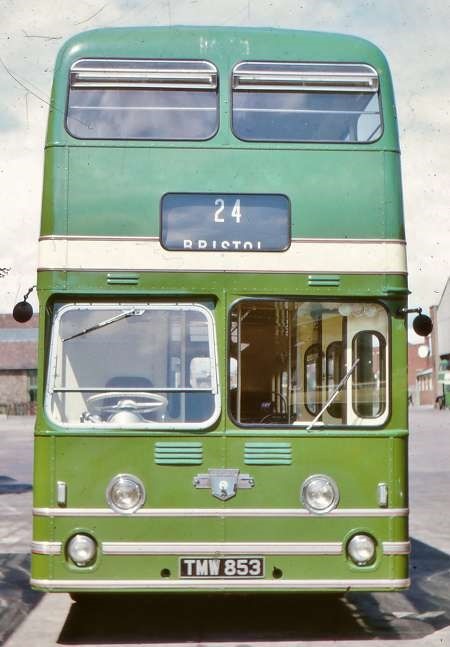 First was the highly individual Green Bus Service (Rugeley and Uttoxeter) Ltd – M.A. & C.J. Whieldon – what an exotic an assorted fleet they had. Then, at Yatesbury, troop transport was provided by the wonderful R & W Febry – "Sodbury Queen" radio luxury coaches – a very smart and proud Firm indeed, and still I believe in haulage in a very big way. Later, at Patrington, East Yorkshire the contrast was fascinating – the magnificent East Yorkshire Motor Services with a glorious fleet, and the tiny Connor and Graham of Easington (Spurn Point) who provided reliable and most useful services almost into the North Sea !! In 1955/6 they had a very elderly conductress called Sally and, many years later after De-mob, I went on an official enthusiasts tour of the area, including being greeted by one of the proprietors. Near the depot at Easington I said to him "I don’t suppose dear old Sally is still around now ??" With a mischievous smile he told me to knock on the door of the second nearby cottage – the door was answered by the good lady herself and I was invited into the original "chocolate box" country cottage and made very welcome – "I’m always glad to see mi’RAF lads" said Sally followed by this classic "Of course I’m not on the buses now yer’ know." Bless her, she must have been close to receiving HM’s telegram !! Is there any record of the sold Silver Star Leyland Atlantic’s that went to Bristol Bus Company for use on the WSM routes. The ex Silver Star Atlantean 1013 MW is in active preservation, as seen here on a re-creation of Silver Star operations around Salisbury Plain in August 2009. This bus saw service with Super Coaches of Upminster and Beresfords of Cheddleton, following its withdrawal from service with Bristol Omnibus.